My kitchen could use an overhaul, and though it is not probably going to happen for a long while, I still seem to constantly be looking for inspiration. One thing that I think would be a lovely touch to this dream kitchen is a custom tile backsplash. Of course, the most productive way of making consistent tiles is with molds. In today’s post, Gary Carlos demonstrates how he makes molds with repeatable patterns for his tiles. – Jennifer Poellot Harnetty, editor. If you want to make many tiles of the same design, have a sculptural tile and want to minimize distortion around the edges, or want a consistent tile thickness, you should consider making a cavity mold. To make a cavity mold, make an original tile with the design of your choice out of clay, avoiding undercuts. Make the walls for the mold around a board that measures 1 1/2 inches larger than your tile on all four sides (use laminated wood as this eliminates the need for a mold release). Fasten the boards together with four spring clamps or C-clamps. If the boards are all cut accurately at right angles, the assembled form will keep plaster from leaking without the need to seal the joints with clay. Put a wad of clay on the outside of the base of each wall to keep the form secure. Rub some water on the bottom of your original tile to create a thin slip and stick it to the bottom board allowing a 1 1/2-inch border around all sides. Save 50% on the PDF! Creativity AND Productivity! There are so many different ways to make molds and templates that the biggest obstacle might be deciding which methods work best for your practice. Making and Using Molds & Templates features a multitude of different ways to make and use molds and templates. Whether you like the precision of plaster, or the ease of bisque molds (or both! ), it's loaded with information that will help you be more successful. Discount applies to PDF only. Sale valid through 4/22/19 at 11:59 pm EDT USA. Pour the plaster at least 1 1/2 inches over the top of the tile – any less and the mold may crack during pressing. For most studio applications, I use #1 Pottery Plaster. Make sure the plaster is fresh (stored for no more than 6 months) and completely free of moisture. Measure room-temperature water and plaster by weight in a ratio of 0.7 parts water to 1 part plaster. Use 1 lb water to 1.4 lb plaster for a 4 1/2-inch square mold and 2.1 lb water to 3 lb plaster for a 6 2/3-inch square mold. Note: I’ve used decimals not ounces. Slowly sift the plaster into the water. Once all the plaster is in, allow it to soak (slake) for one minute without any agitation. Mix the plaster with a clean stick until it becomes a heavy cream consistency (a milkshake consistency is too thick). This should ideally take 2 to 3 minutes, but can happen anywhere from 1 to 5 minutes. 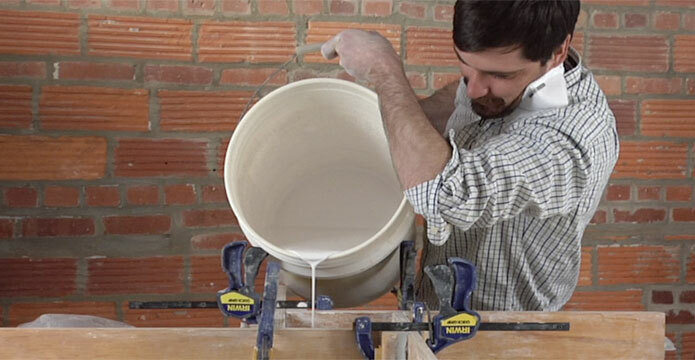 When the plaster has reached a proper consistency, pour it into the form in a slow steady stream. Shake the table (but not too much) to bring any air bubbles to the surface, and to settle the plaster out, making the top completely flat. Swirl some water in the dirty mixing container immediately and dump it into a waste bucket (never down the drain!). When plaster sets, it gives off heat. After about 30 minutes it will cool back down and you can then take the form apart. If the boards stick give them a quick tap away from the mold and they will pop off. To use the mold, cut a slab of clay the same size as the opening. Cover the clay with canvas and use a rubber mallet and a block of wood to press the clay into the mold. Use a wire cutter to slice off the excess clay. The homemade wire tool shown at right is based on one used at Moravian Pottery and Tile Works (where I had attended a workshop). Use a wooden straight edge to scrape off and level the back of the tile. You may want to sign or stamp the back at this point. Give the clay some time to set. This may vary greatly depending on the weather and dampness of the mold.After the clay has set up to about leather hard, you should be able to easily pop it out of the mold. To see images of Gary Carlos’ work, visit http://www.simayspace.com/garycarlos.html. What kind of clay body are you using? You need a groggy clay for tiles. I have found that putting the tiles on a wire rack as soon as they have set up enough that they won’t be marred by that rack, works well. The air can circulate all around and one side doesn’t dry out faster than the other. An ideal space would be inside one of those cheap mini greenhouses set up in the studio so that there are no breezes and they will dry slowly…. The other thing I find helpful in keeping files flat is to remember that clay has a nemory. Keep the clay as flat as possible throughout the process. If you cut a slab off the bag or roll it out and then pick it up by one corner, putting a bend in it, the clay will remember that bend you made and want to make it again. This message is for David Crow about the curling problem with his tile. If you place your tiles between sheet rock with at least a 2 inch border around each tile then place them is a cool place it should prevent curling. I have placed large thin slab as large at 24″ x 24″ with no curling. Also check with your clay supplier around the type of clay you are using it may not have enough grog. Good luck. To make sure the tiles don’t warp you need to make some groves on the back – you can use a turning tool (preferably one with a loop) to remove the clay. Don’t go right to the edge – start & finish about 1cm from the edge and don’t go too deep. On a 6″ tile you would probably need three or four parallel grooves. When fired, these grooves will also help when fixing the tiles to the wall or other surface. Check out the backs of tiles in museums – most of these will probably have similar grooves. Does anyone have a reliable method to prevent curling of the tile when drying ? I have tried covering with plastic and leaving in the mold but this can cause damage to raised pattern, I have also tried wrapping the edges with cling film to prevent them drying more quickly but with only limited success. The problem increases if I try to make thinner tiles to match commercially produced ones. Hi Leslie, The original that I use is not fired. It fact it is not always as dry as leather hard. I keep measuring the tile as it dries and when it shrinks to just the right size that is when I pour the mold. I actually make my tile mold in the same way that you do. However I have found a easy way th press clay into my molds. I put the clay plug in the mold I put a cloth on it and a board then I put it down on the floor and I stand on it. This works very well for me. Is the original tile used to make the mold left leather hard or bisque fired?